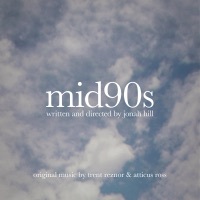 The Mid90s soundtrack is composed by Trent Reznor and Atticus Ross, who are also responsible for the critically acclaimed score of The Social Network. The Mid90's soundtrack consists of a somewhat minimal score, with only 4 songs which can be found below. Stevie and his mother Dabney celebrates Ian’s birthday at a restaurant. Stevie hands Ian his gift. Stevie enters the skateboard shop and overhears a group of kids playing “would you rather”. Stevie overhears the kids commentating on the French skaters on the TV. Continues as Stevie trades Ian his games for his skateboard and practices skateboarding at his backyard. Stevie enters the parking lot of the skateboard shop and meets Ruben. Stevie and Ruben smoke cigarettes. Ruben tells Stevie to get a new skateboard and that he could give him his old one for $40. Stevie runs to the gas station restroom and cleans the smell of cigarettes with soap and an air freshener. Stevie buys his new skateboard from Ruben at the shop. The group asks each other racial questions. The group skateboards down the highway. Ruben and Stevie pee on the basketball court. The group hangs out by the entrance when they are confronted by a security guard near the fence. Ray scares the secruity guard away. Later, the group hangs out at the courtyard. Stevie and Ruben sees Ray talking with two famous skateboarders. Fuckshit talks with a man about skateboarding as Stevie skateboards around the courtyard. The police enters the premises and begins arresting the skateboarders. Fourth Grade films the group jumping the gap at the rooftop. Stevie enters the shop with new clothing. Ray hands Stevie a brand new skateboard. Stevie eats By the Mexican food stand with his friends when Fuckshit gets into a confrontation with Ian. Fuckshit hands Stevie and the group pills at the bus. Fuckshit grabs booze from the refrigerator and hands them to the group. Stevie smokes weed at the kitchen. Montage of the group partying and drinking. A girl asks Fourth Grade about why he films movies. Stevie is smoking weed at the kitchen when a girl approaches him and starts talking with him about his friends. Stevie talks with the girl about his previous relationship. The girl takes Stevie to Angelia’s room and starts taking their clothes off. Estee and Stevie kiss at the bedroom. The scene cuts to Stevie leaving the bedroom and telling his friends about his experience. Estee talks with them girls on her experience with Stevie. Stevie’s mother confronts Fuckshit and the group over giving Stevie alcohol. Stevie and Ray skate around town. Party at the back of the store. Fuckshit and Stevie mingle with the skaters there. Stevie drinks while skateboarding. Ray talks the booze from Stevie and tells him he had enough. Fourth Grade shows the group an edited video of their daily activities titled “Mid90s”.